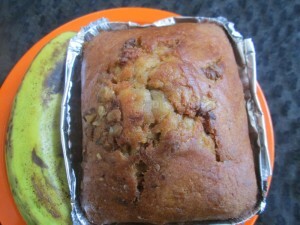 Banana cake is a delicious cake and it is very easy to prepare at home. It can be served as a teatime snack or nalumani palaharam. While serving this cake on special occasions can surprise the guests, friends and other loved ones. Definitely it will attract the children and they will enjoy to have this special cake. Consuming banana is good for the health. There are many health benefits for banana. It contains Vitamin A, Vitamin B6, Vitamin C, fiber, protein, iron etc. It helps to control cancer, asthma, blood pressure, heart related problems etc. Add all the dry ingredients such as flour, sugar, baking soda, baking powder and salt into a bowl. Mash the banana in a separate bowl and add the vanilla essence. Beat the butter and sugar well using a blender. Add 2 eggs and mix well. Add the dry ingredients mixture with mashed banana then mix well. The cake mix is ready. Grease a pan with butter. Pour the cake mixture to the pan. Use a spatula to spread evenly. Put it on the oven and bake for 30 minutes or until cooked until golden brown on the top. Cool the pan for 5 minutes. Tasty Banana Cake is ready.